After a few hours with the game I've learned to watch my back in Total War Saga: Thrones of Britannia. You have to work hard to earn the loyalty of your supporters, armies take several turns to muster, and dilemmas can throw a campaign in unpredictable directions. Thrones also takes place on a much denser map than other Total War games. The British Isles and Ireland are split into intricate arrays of interlocking provinces, and different regions can greatly affect the types of building available to you. 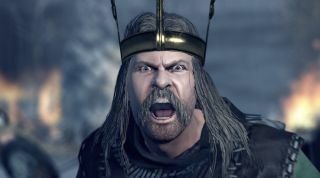 That's a lot of important changes, so we asked game director Jack Lusted about the ideas behind these reforms, and his intention to create a Total War that produces emergent stories in a fractious era. But first, an origin story. How did you get into game design and how did you start working for The Creative Assembly? From there I got into modding. I modded Rome 1 and Medieval 2, which got me a few contacts in the company. Then in summer 2007 I joined as a tester with a fast-track to design, because no games industry experience, no degree, they weren't about to let me loose on the games just yet. From there I did design on Empire, unit design lead on Napoleon, Shogun 2, Rome 2, and then new content team, and game director! What kind of mods were you making to start with? My Rome 1 mods were compilation mods with a bit of gameplay tweaks. It was other people's skins and maps but I did my own gameplay tweaks on top of it. [Medieval] 2 was all about gameplay. It was trying to do a vanilla plus experience. I did different era start dates. I modded campaign AI and battle AI, which was used as a basis for that in other mods as well. In your first role as game director, what was it you wanted to change or refine about the Total War formula? For me I'm always interested in taking cues from board games, things like that. Total War has gotten really big in terms of systems. I'm interested in the ones where systems are, on their own, easy to understand, but there's a lot of complexity in how they interact with each other. That's at the heart of what we've done with characters where everything is now focused on attributes. It's easy to understand your choices and what traits you're getting when you can see 'ah this is +1 command, - governance' kind of stuff. It's about trying to get all these systems working with each other, which makes it hard to talk about individual features of Thrones because we've changed recruitment, which ties into generals and characters, which ties into food, which ties into buildings, which ties into governors and all that kind of stuff. In the new system character traits are listed in the middle of their character sheet. The followers you see listed on the right side can be acquired when you level up. How do you want characters to work in this games. You don't really have agents in the same way, you've really focused in on generals and governors. The key thing for us is having two different things to characters, stuff you can't control, and stuff you can. Characters come with traits, and you have some control over traits, you can fight in battles and build buildings and stuff, but it should be largely organic and feel like as you're using your characters they're getting more and more interesting over time. Then the followers are the bits where you do have absolute control. It's really easy to see for the player, 'right, I want to do this with this character so here are the followers to put points into'. That allows players really easy choices. Do I want to go broad with my skill choices, do I really want to burrow down to do one or two specific things. It's quite cool watching people's responses to a video we put out on characters and going 'oh these combinations sound really broken together'. Yeah, if you have a level 10 general, sure, you can do that, but then you're sacrificing other stuff. It was a big decision to remove skill trees from characters. Skill trees work really well in a game like Warhammer where you have your game for a really long time, and where so much of the game in the campaign and in the battles is about the characters and how powerful they are. It makes sense to go for these choices. With Thrones being all about narrative and emergent story and stuff, having skill trees where you have to go through four or five different levels to get what you want feels like it's going against that. You're being forced down a path to get to what you need. With followers there's a flat level of eight of them and you can put points into whichever one you want. It felt much more in keeping with making choices that are based on the traits of the character and the situation you're in. The storytelling was definitely a strong part of what I've played so far. The loyalty system seems particularly important for driving story and creating dilemmas. I was playing as the viking faction. Was loyalty a particular focus as a dramatic device? I think you need to in this era. Because the politics now are so focused around the faction leader and how good they are not just at being a king, but redistributing wealth and stuff, you've got to have that threat of characters there, otherwise you have a system where you're not worrying about consequences. If I'm a really bad king, people are going to rebel, there's going to civil war, there's going to be challenges to my throne. The estates system helps with that, because that gives you tangible things, I have these counters I can hand out to characters, but once I've handed them out I can't get them back without killing them or doing political actions which could further weaken my position. Again, it's all about those clear choices about what you do with it. I quite enjoyed piling priests on people to keep them loyal as well. That's definitely one way to do it as well, but then you're sacrificing these bonuses for that. But I really like building these stories. Political events are a nice way to add to that. I'm not sure if you've had any of the events where you get the 'vengeful' trait on characters. Not yet, no. That sounds good, though. If you strip an estate from someone or you secure loyalty in a certain way they might agree, but they'll become vengeful, then they might have other events pop up based on them working against you now. Again, trying to give you the sense that there are choices, there are consequences as different events emerge as you play the campaign. I did have the chance to torture a guy, actually, but I decided to just pay him off instead. Ah, that's an interesting one because that trait, if you have that enforced loyalty. That will, over time, adapt. For a number of turns he will be loyal, and then afterwards, he will not be loyal. And he will remember that you tortured him. Things definitely come back to bite you. With the dilemmas in particular, they can have some significant effects. Recruitment is a huge change, I found, it does change the way I think about turns and planning ahead. What were your design aims changing recruitment to a big pool from which you muster? It's a lot more true to the era, and also I really wanted to try a Total War without recruitment buildings. So often discussions around building are about which ones are your military provinces. Let's remove that from the equation, make provinces all about what those provinces are and the bonuses they give and trying to customise your buildings to maximise that, and have the recruitment be much more true to the time period. You can raise as many troops as you want in a turn if you can afford it, if you've got the food, and then it's going to take time to be combat ready. Yeah, vikings come and raid you, and you need to raise an army on the back of your lines to protect you, probably a bit too late. You're going to lose some settlements, and you're going to have to take them back. It feeds in well with the war fervour system. I think that worked really well with Age of Charlemagne when we introduced that, adding a much more cyclical nature to the game. The recruitment system works with that. I want peace for X amount of turns while I build up my forces, to build back up my war fervour, then I can commit to the wars, and pause and rebuild again. You can sometimes in Total War get stuck in that cycle. You beat one enemy, the next person declares war on you, you fight them, then the next person... it's all about trying to give more breaks and different flows to the game, more of a chance to think. There's more of a point to peace, I suppose, rather than just trading and pooling wealth. It's about remustering your troops. It's about building up your war fervour so people aren't too annoyed when you get dragged into another fight. From what I've played of the game it feels like I'm reacting more to circumstance in the game rather than just expanding and spreading across the map. The game is there for there to be something interesting going on each turn. You're having to consider and factor into your plans. Not necessarily having you go 'ugh I have to react to this and that', it's about choices that feel meaningful to the player that factor in nicely with the way you're playing the game. Total War Saga: Thrones of Britannia in out on May 3.